Dr.Sopon Pornchokchai, President, Agency for Real Estate Affairs and also President, FIABCI-Thai would like to inform you that the 2018 FIABCI World Prix d’Excellence Awards is Now Open For Registration for our Thai real estate developers to go to compete abroad for our Thai prides. 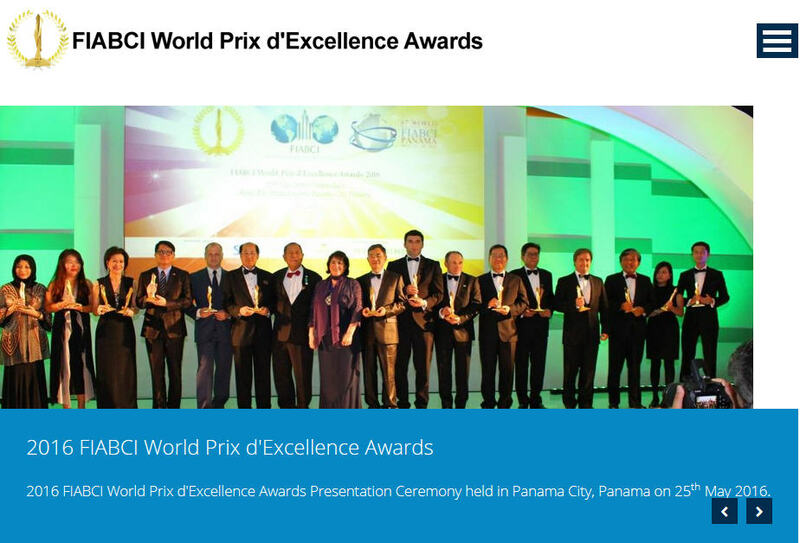 FIABCI organizes World Prix d’Excellence Awards annually since 1992 to recognize property projects which best embodies the excellence in all real estate disciplines. The Award illustrates the idea of providing society with the optimal solution to property needs. A project by a private developer or public sector. The building must adhere to the affordable housing criteria and guideline provided by the government. Project that rehabilitates an environment or to conserve existing environment, i.e. Ex mining land, polluted river, land fill, land that has been damaged severely by industrial use, marshland destroyed by deforestation or such similar damaged land. Restoration or conservation old buildings that have been identified by the relevant authorities for Heritage Conservation. Business type or leisure type, service apartments that are strictly operated as hotel, etc. For industrial building, industrial parks, technology parks, warehouse, factory, workshop, etc. Project exclusively financed and developed by public fund, i.e. government building, hospitals, road, bridges, airport, stadium, etc. For project/building that does not comply with any other categories. For instance, the hospital, airport, bus terminal, university and school, etc. This project should be funded by private sector and profit generated. Mall, shopping centers, hypermarket, etc. Beach resorts, hill resorts etc. Resort is a place used for relaxation or recreation, attracting visitors for holidays or vacations. A self-contained resort attempts to provide for most of a vacationer’s wants while remains on the premises, such as food, drinks, lodging, sports, entertainment and shopping. All submission will be judged in 2 tiers, firstly by Judges and secondly by Oversight Panel; who are experienced professionals and experts in Real Estate Industry from all over the world. Judges are to abstain from judging the entire category with projects from his/her home country to ensure the integrity, transparency and unbiased of judging of the Awards. The entire judging process is scrutinized by an Independent Auditor. World Gold Winners and World Silver Winners will be selected from each category. The Award Presentation Ceremony and Dinner will be organized in Dubai, United Arab Emirates in conjunction with the 69th FIABCI World Real Estate Congress in May 2018, hosted by Dubai Land Department. All World Winners are bestowed the right to use the coveted exclusive FIABCI World Prix d’Excellence Awards logo. The news would also be publicized through the platform of our International official media – International Business Paper, The Wall Street Journal. The FIABCI World Prix d’Excellence Awards has been recognized as the “Oscar” of the property and real estate industry in the world and developers are aspired for the award. Far East Organization of Singapore have proudly advertised the winning of the awards with a big billboard in the arrival hall of Changi Airport Singapore; SP Setia Group from Malaysia, after winning the awards, was invited by the Vietnamese Government to a Joint Venture development of 1,400 acres eco project. These shows the true benefit that one can derive from winning FIABCI World Prix d’Excellence Awards.